People have been contacting us about the possibility that one reason for Flint’s plans for a new pipeline for water from Lake Huron through the recently formed Karegnondi Water Authority, is to provide water to the frack industry. This first came up in a blogpost “Could the Flint water crisis have its origins in a desire to open up new areas of Michigan to fracking?” and it’s been repeated in other reporting, such as Motor City Muckraker and Eclectablog. A connection is there, but unless new evidence turns up, it’s not that the new Karegnondi pipeline necessarily would provide water directly to the frack industry. Instead, the likely scenario is that as the gas and oil industry drills and/or fracks in the Genesee, Lapeer, Sanilac, and St. Clair county areas along the pipeline’s routes, residential water wells will go bad and become contaminated, forcing residents to tie in (buy in) to the new Karegnondi water system, making them rate-paying water customers. Monetizing water for people who currently get their water from groundwater wells is perhaps part of the business plan behind Karegnondi. Michigan has more private groundwater drinking wells providing water to residents and municipalities than any other state. The more the frackers can have access to that water, pushing more and more people off the groundwater supply and onto privatized or monetized sources, the better for the oil and gas industry, and the much worse for the public. Download the Karegnondi pipeline map pdf. “Drill, baby, drill” is written right into the law. This must change. It’s been there since 1939. The Committee to Ban Fracking in Michigan has written a ballot initiative to change this statute, ban fracking and frack wastes, and ban acidizing in horizontal well bores. The state has a deeper, darker “role”: It also makes money from the production of oil and gas. In effect, the state is a business partner with the oil and gas industry, even though, it’s supposed to be regulating it. In this case, “regulating” means giving them every opportunity to extract fossil fuels and make a profit. It’s more insidious than that. Much like the lead industry waged a campaign to outfit the nation’s infrastructure with their deadly lead pipes (see: The Lead Industry and Lead Water Pipes: A “Modest Campaign”) we see these same devices being used today by the oil and gas industry to install their deadly infrastructure of natural gas plants, frack wells, compressor stations, toxic injection wells, and pipelines. And the DEQ is right there with industry, promoting it, and mouthing the same propaganda. Brad Wurfel, the disgraced former DEQ spokesperson who recently resigned for his despicable role in the #FlintWaterCrisis (and who said “anyone who is concerned about lead in the drinking water in Flint can relax”) has repeated frack industry talking points like “new fracking technology is a potential game changer for this country.” He also said: “The state’s regulatory program is regarded nationally as one of the toughest — a safe, effective way to allow domestic energy production while protecting the land, air and water.” An interview by the Rockford Squire with DEQ’s Wurfel reads like an ANGA (American Natural Gas Association) commercial, while putting down residents sounding the alarm about the harms of fracking. There are plans for fracking and other drilling activity in Genesee, Lapeer, Sanilac, and St. Clair counties. There are already four “high volume, hydraulically fractured,” frack wells (those using over 100,000 gallons of water per well) in Sanilac County: the Schultz, Walker, State Wheatland & Reinelt, and Van Damme wells, all targeting the A-1 Carbonate formation. (See current map of DEQ wells). The State auctioned off state-owned mineral rights to acres throughout the area, with 200 acres auctioned in Genesee county near Holloway Regional Park. In 2013 land men from Western Land Services combed the area meeting with landowners, buying their mineral rights. Local residents organized in opposition, with Oregon and Richfield Townships in Lapeer County passing resolutions against fracking. And large gas storage fields (like the Porter Ranch, California storage well that is leaking massive amounts of methane) are located in St. Clair County. It’s possible that municipal water from Karegnondi could be used in the future for fracking. The frackers have certainly purchased water from municipalities in the past when groundwater supplies became scare or insufficient. 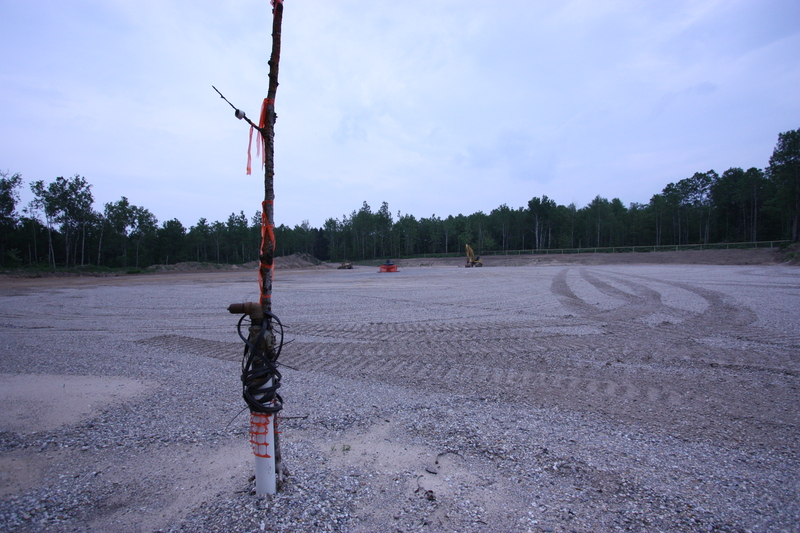 With the Westerman frack well in Kalkaska County the frackers ran out of groundwater, bought public water from the nearby municipality, and when that wasn’t enough for the frack job, resorted to drilling 8 more water wells on site. 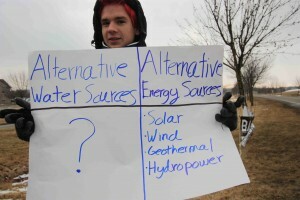 The frack industry uses ground water for free. A lot of it. Water well drilled on the site of the Mancelona 1-28 HD1 horizontal frack well, on state forest land. The frackers use public groundwater for free. Photo by LuAnne Kozma. 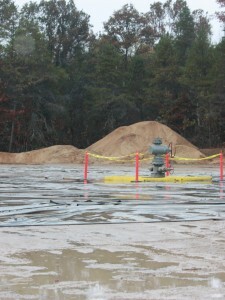 Generally, though, the frack industry uses ground water from temporary water wells they drill on the site of the well pad (see above photo). If the frack well is on state land, that means the frackers use this publicly-owned resource for free, and use as much as they want. The hokey, much criticized “water withdrawal assessment tool” (WWAT) is used by the Michigan Department of Environmental Quality as a guise to make it appear they’ve considered the quantity of water being removed from the ground. In fact, it does no such thing, records no cumulative records of how much water is removed from the aquifers below, and studies no impacts. And when a frack well applicant fails the WWAT, the DEQ staff simply visit the site, and then rubber stamp the approval anyway. One well, which failed the WWAT, used over 21 million gallons of water. (See: Michigan’s 21 Million Gallon Frack Job and Michigan Gas Wells Surpassing All Water Records, Governor-approved Frack Panel Unconcerned). 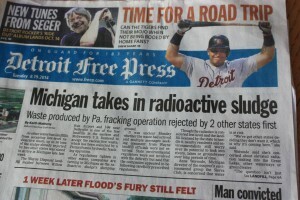 The frack industry, if it does all the drilling it wants to, will thirst after Michigan water. 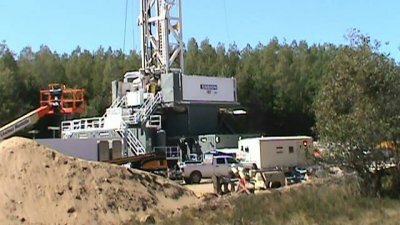 One estimate from 2013 was if Encana (now sold to Marathon) drilled the 500 wells they projected, the company would use and destroy 4 billion gallons of groundwater, about what Traverse City uses in two years. The DEQ keeps this list of the water amounts used by the industry’s recent “high volume hydraulically fractured” wells. 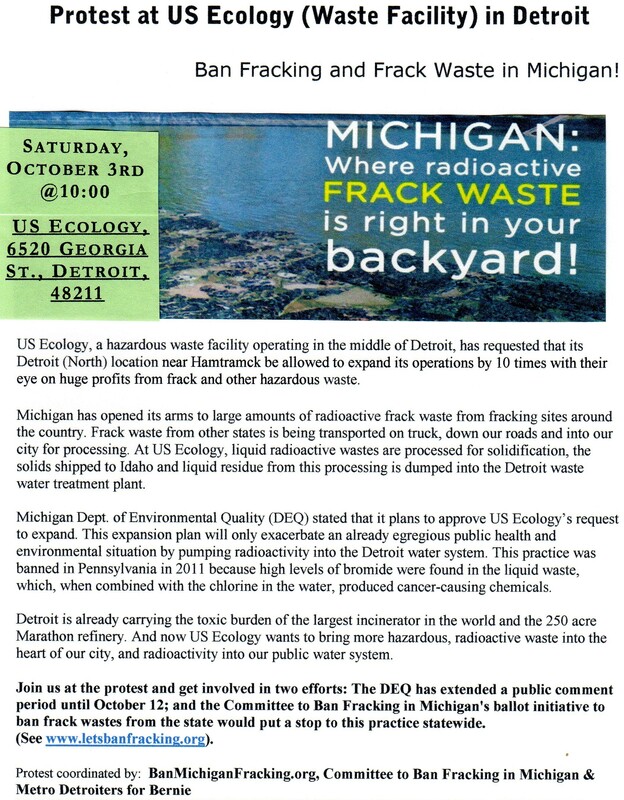 Governor Snyder said in a televised debate, “in Michigan we do fracking right” and “we work with industry….” And now you know why the DEQ works with industry to contaminate Michigan with toxic chemicals, toxified water, and frack wastes from other states. With the world now watching Michigan’s governor, his emergency manager-based autocracy, his words and actions in the #FlintWaterCrisis, the Detroit Public School takeover, and the frack industry invasion, Michiganders and others are now seeing through this flim flam. For more information about the harms of fracking and the ballot initiative to ban fracking and frack wastes statewide, see the Committee to Ban Fracking in Michigan’s brochure. 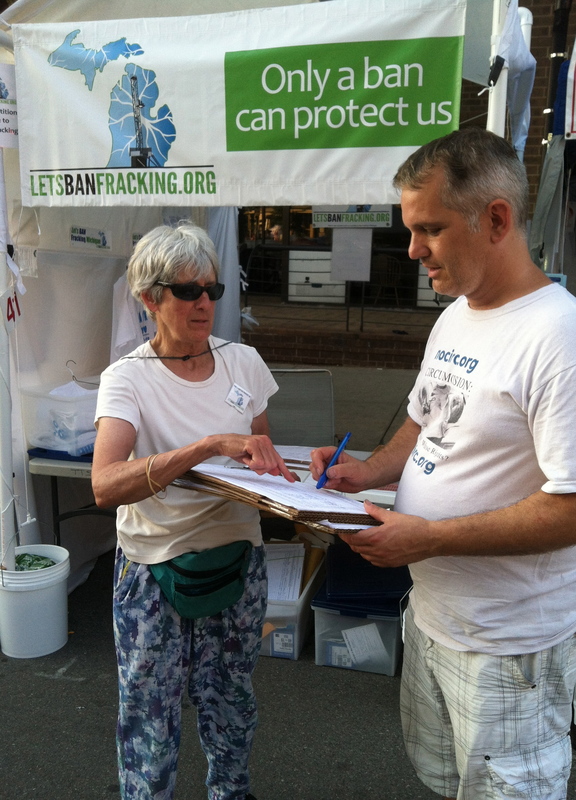 The Committee is collecting signatures before June 1 to get the ban on fracking and frack wastes on the ballot this November. Residents in Southfield and the metro Detroit area have organized to oppose a new drilling application to drill for oil in this Michigan city of over 70,000 people. 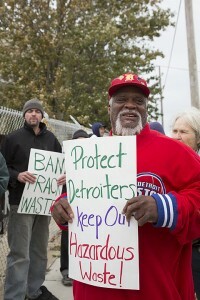 “Stop the Drilling in Southfield” plans a protest at the drilling site Sunday, January 17 at 9 am. Word of Faith, a “mega church,” owns the property and has leased out its minerals to Jordan Development. The site is at Nine Mile and Evergreen, a densely populated area, only 2 miles from Providence Hospital. The City of Southfield issued a moratorium on all drilling in the city and and it remains in effect through April 28, 2016. See the city’s press release: City of Southfield Oil drilling moratorium. Though the company and church claim there will be no fracking, they propose to vertically acidize in the Niagaran formation, which has been horizontally fracked with multiple horizontal bores in Montmorency County (See the Hubbell 2-22 HD1 and Hubbell 2-22 HD2 well). There is no guarantee that this proposed well wouldn’t be used with multiple wellheads and eventually with horizontal well bores. Methane would be flared (burned) into the atmosphere. This, too, will pollute the air and harm residents. 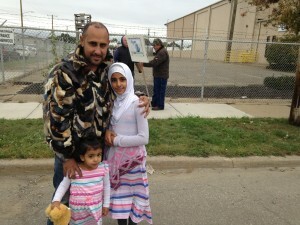 To join the protest, meet at 9 am at the NW corner of 9 Mile Road and Evergreen in Southfield. Bring protest signs. Download the groups flyer here: Stop the Drilling in Southfield – final PDF (2). Marathon’s well near Grayling: a ‘test’ or a ‘nightmare’? One day in August I drove to Crawford County to take a look at Marathon Oil’s recent activities along King Road in Beaver Creek Township, which is near Grayling. 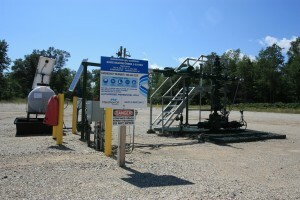 State Beaver Creek 1-23 HD1, a horizontal frack well in the state forest, has been producing on a pad there, tapping the nearly-two-mile-deep Utica-Collingwood shale for some time. In late July Marathon applied for a second horizontal frack well on the same pad, named State Beaver Creek 1-14 HD1, which would explore into the Detroit River formation, about a mile shallower than the Utica-Collingwood. 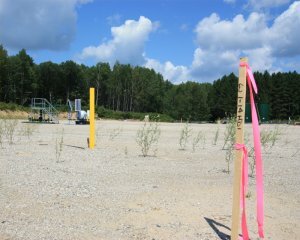 This is the first high-volume frack well to explore in this formation in Michigan. Not much was happening that day on the pad. But previously I had noticed an unusual feature on the plat accompanying the application for the new well, a half-mile away. It was labeled “State Beaver Creek D4-11″. 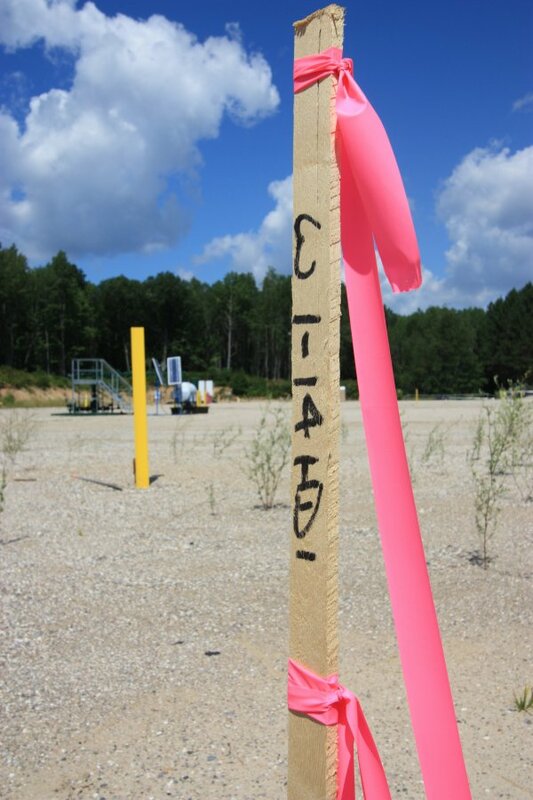 The nomenclature is not typical for Michigan wells and no operator name was given. I thought it might be a processing facility of some kind. D4-11, still a forest on August 15. Photo: Ellis Boal. Click for close-up. I didn’t see a direct two-track through the forest between the wellpad and D4-11, so I drove around and found an old one leading to the spot where it was supposed to be. There was nothing but trees, and a few scattered stakes and flags. No permit was posted. Nothing indicated that something big was about to happen. A week later, in a quick turnaround time DEQ issued the permit for State Beaver Creek 1-14 HD1. You are correct. Nothing is available for any part 625 test well. It is confidential for 10 years. Well, “nothing” was not really the whole truth. Part 625 regulations required Marathon to send the first page of its application to Beaver Creek Township, “post the permit in a conspicuous place” at the surface location until drilling is completed, and post a “conspicuous” sign near the wellhead showing the permit number. D4-11, a/k/a the “science well,” under construction on August 26. Photo: Gary Cooley. Obtained publicly from the township, the first page of the application tells us: Marathon posted a conformance bond of $33,000, the well is vertical, sour gas is expected, the intended total depth is 4700 feet, and the target formation is the Amherstburg. This is a fossil-bearing non-shale formation in the Detroit River group, the same formation being explored by State Beaver Creek 1-14 HD1. Vertically, D4-11 is just 300 feet deeper. I visited again on September 20. This time there was a nearly-200-foot drill rig there, operating with a loud hum. The rig name, Ensign 161, was prominent on the side. I was wearing my letsbanfracking t-shirt. Three workers came out. I identified myself and we chatted. They were from out of state. I asked who was the supervisor. They didn’t know, they said. Later toward midnight I drove by again, this time staying on King Road. Through 100+ yards of trees I could hear the hum. Over the tree line I could see lights on the rig. Two days later Gary Cooley, who has a home a little over a mile from D4-11, visited and took pictures of the rig in operation. On September 22, I sent DEQ a formal FOIA request asking for all its documents on the facility. 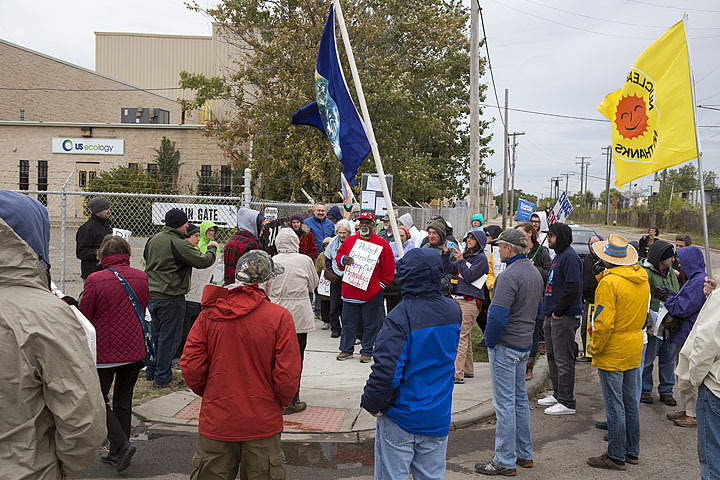 DEQ denied it on October 1, citing section 8 and section 9 of part 625. But section 9 only says that the application and permit are “confidential in the same manner as provided for logs and reports on these wells.” Section 8 says “Logs on brine and test wells shall be held confidential for 10 years after completion.” It adds that “logs” — but not “reports” — can be held confidential even longer, forever. Marathon’s application, permit, and pre-drilling correspondence with DEQ are not “logs.” So according to these sections, they were not confidential until the well was “completed.” And according to part 625 rules, completion was not until the well reached its “permitted depth or the [DEQ] has determined drilling has ceased.” Obviously, D4-11 was not complete on September 20 or 22. Ensign 161 was still there, and working. So DEQ should have produced the application, permit, and all records other than logs. On October 2 I visited again. A different worker came out to say hello. He said his name was “Trace” and he was the Marathon safety man. Asked how long the rig would be there, he didn’t know and said they were hoping to find gas or oil. He gave the card of his boss in Houston, in case there were further questions. A brief internet search showed that earlier this year Ensign 161 was active at Marathon wells in three different counties of western North Dakota. Fracking for oil there is big business. Part 625 does not define “mineral.” But in ordinary English minerals are understood to be hard, crystalline, and inorganic. They are extracted by mining. Gas and oil are extracted by drilling. 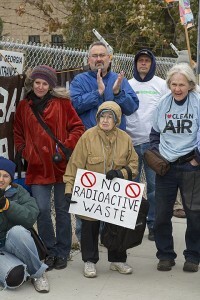 They are not in DEQ’s list of Michigan minerals. There are no minerals of any kind in Crawford County, according to the list. Anyway, the idea of looking for a mineral in a 4700-foot hole is ridiculous. Cooley’s nightmare. Photo: LuAnne Kozma. Click for close-up. Part 615, not part 625, was the part under which DEQ granted the “exploratory” permit given for State Beaver Creek 1-14 HD1. As an exploration well for gas and oil, D4-11 should have been permitted if at all under part 615, not part 625. Whats’ the difference? A big one is that confidentiality under part 615 is quite limited. Logs and other data are confidential only for 90 days after completion and then only if the operator requests confidentiality. All other documents, including applications, permits, and pre-drilling correspondence, are routinely made public to me or anyone else at any time. The same is true of logging and production data after the 90 days has passed, or even before 90 days if the operator did not request confidentiality. Another difference is that part 625 has no rules prohibiting nuisance noise. Part 615 does. What will D4-11 do to the countryside? Part 625 rules allow for horizontal mineral wells, though fortunately this well is vertical. The rules also allow for acidizing, perforating, and fracturing. As mentioned, so far only the first page of Marathon’s application for D4-11 has been made public. Applications typically run to 50 or 100 pages. The full application had to include an environmental impact assessment. DEQ’s form for that required Marathon to identify distances to nearby water wells and other human-made features, and wetlands, surface waters, and endangered species. Marathon should have stated if high-volume fracking will be done in which case it should have specified the water volumes and a water assessment, and identified at least some of the chemicals. It should have explained how muds, cuttings, pit fluids, and brines would be disposed. It should have given details about any flowline or other facilities on the pad, and explained how it would deal with soil erosion and sedimentation. 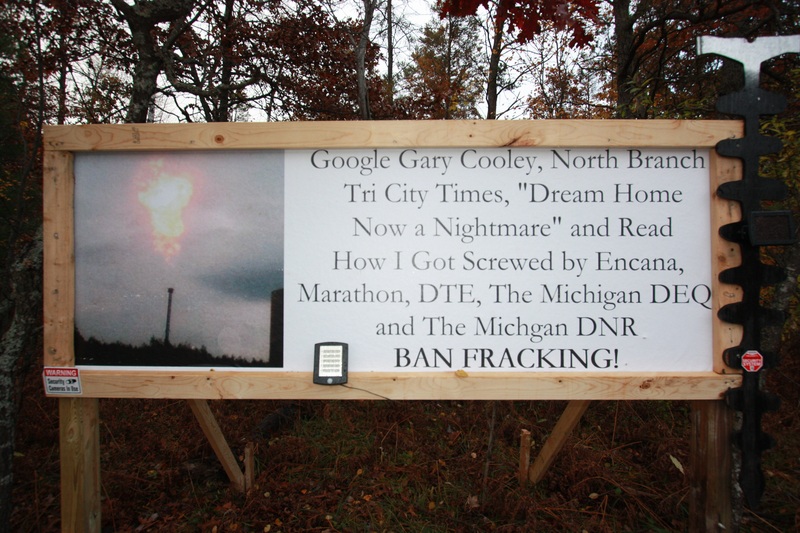 Cooley and Ban Michigan Fracking are appealing DEQ’s refusal of D4-11 information except for the logs. Ninety days after completion the logs will be requested too. A monster operation like this is a matter of public concern. People birding, hunting, or snowmobiling in the forest are entitled to know what DEQ knows, including the environmental effects and everything else. Separately, On October 8 I wrote the Marathon boss asking him to confirm Trace’s statement that D4-11 was looking for gas and oil, and provide a copy of the “application [and] permit.” A week later a PR flack wrote back confirming a permit was issued but refusing to send any documents. D4-11, October 16. Photo: LuAnne Kozma. LuAnne Kozma (the director of Ban Michigan Fracking and the Committee to Ban Fracking in Michigan) and I visited the site again on October 6, at twilight. Ensign 161 was lit up. She recorded the sounds and pictures in the video above. On October 16 we visited the last time. Drilling was complete. The pad was quiet and empty, a gash in the forest with a blowout preventer at the center. No sign displayed the permit number, “conspicuously” or at all. Ensign 161 had moved a half-mile to the pad of 1-14. It was drilling there in the same Detroit River formation. The rig is expected back at D4-11 soon, after Marathon runs the numbers. It cost millions to cut the trees, excavate the pad, and bring in the rig. The company won’t want to walk away empty-handed. And next time the bore would not just be vertical. It could be aimed right at Cooley, his nightmare. Marathon Oil applied for a horizontal frack well in Michigan this past July, its first since buying out Canadian frack company Encana’s Michigan frack wells and permits last year and becoming the biggest potential fracker in the state. Marathon acquired 430,000 acres of state leases from Encana. At the October auction of the Department of Natural Resources (DNR) it added 148,000 acres, and 53,000 more this May. That works out to nearly 1000 square miles of leases under state land. The number does not count private leases it may also own. The Department of Environmental Quality (DEQ) granted permit # 61130 unusually quickly, on August 21. Stake and flag for Marathon’s applied-for State Beaver Creek 1-14 HD1 in Crawford County. In the background is the blowout preventer for the existing State Beaver Creek 1-23 HD1. Click and then click again to enlarge. Photos by Ellis Boal, 8/15/15. Till now Marathon has kept its plans under wraps. The 80-page application is viewable and downloadable here. 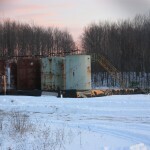 Named “State Beaver Creek 1-14 HD1,” the well, located in Crawford County, would descend to a true vertical depth of 4400 feet into what is called the “Detroit River” formation. This is a Devonian-age rock composed of a mixed series of carbonates, evaporites, and sandstones. 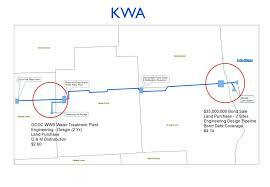 It is shallower than the record-breaking Utica-Collingwood frack wells drilled in the area by Encana in 2012. Horizontally in the Detroit River formation, the bore would then head south 5255 feet. It would be an exploratory well. The surface hole is said to be 55 feet south of an earlier Beaver Creek wellhead on the same pad, named “State Beaver Creek 1-23 HD1,” which is now producing. Encana’s application for the earlier well cited 350,000 barrels of water, or 14.7 million gallons, as the amount it would use for fracking. Marathon’s surveyor was Dean Farrier. He claims to moonlight as a “biologist.” In January 2013 he prepared an environmental impact assessment for the gathering line for the earlier Beaver Creek well. Asked by the Public Service Commission to demonstrate the efforts and resources he used to write the assessment, he said he “conducted a thorough onsite survey of [the] pipeline route for the presence of protected species” including what he called “Kirkland’s” warblers. The claim is ridiculous. He didn’t pay attention in the biology classes. They are “Kirtland’s” warblers. At the time of his survey they were actually 1000+ miles south, wintering in the Bahamas. Kirtlands are beautiful, popular, and endangered birds, for which a local community college is named. Marathon’s application says the new well may pass through sour gas (H2S) zones. H2S is lethal. 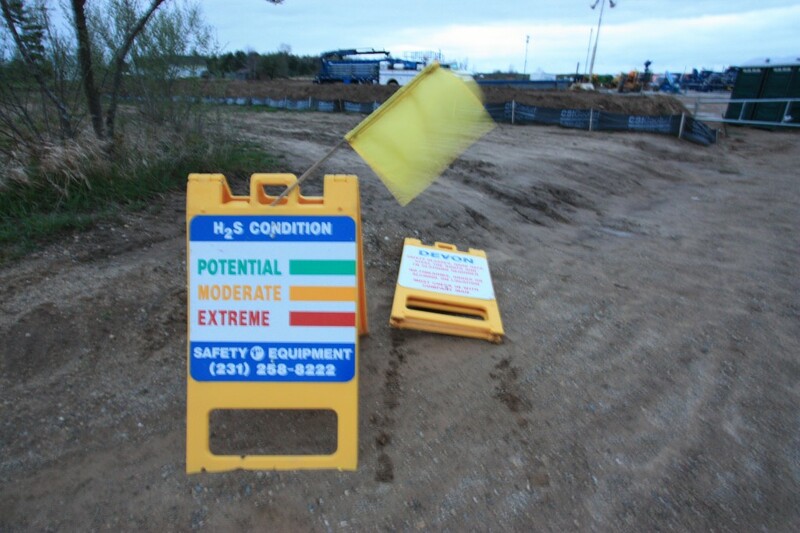 The application includes a 30-page “contingency plan” for dealing with H2S. If there is an uncontrolled release, the extreme recommended solution is to ignite the well via an upwind approach, wearing self-contained breathing apparatus, using a meteor-type flare gun and a safety rope attached to a backup responder, with a quick retreat path available. After ignition, H2S converts to sulfur dioxide which is also highly toxic, according to the contingency plan. The Waters landfill in Crawford County. Photo by LuAnne Kozma. 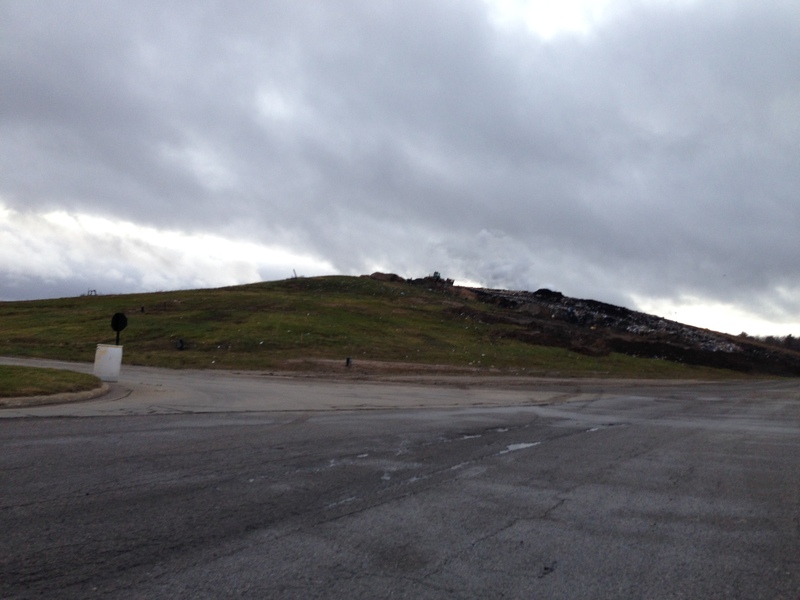 Cuttings and muds will be disposed at Waste Management’s nearby Waters landfill. The chemical constituents of the frack fluid are said to be: water, hydrochloric acid, crystalline silica quartz, tributyl tetradecyl phosphonium chloride, hemicellulase enzyme, propargyl alcohol, methanol, hydrotreated light petroleum distillate, alcohol C12-16 ethoxylated, ammonium chloride, naphthalene, ethanol, heavy aromatic petroleum naphtha, and guar gum. Marathon also filed an application for a pooled 800-acre spacing unit. It notes there are numerous critical unknowns with the Detroit River formation in this area. These include reservoir pressure, permeability, porosity, hydrocarbon saturation, and in-situ rock stresses. This well would be the first in the drilling unit. Marathon paid a $300 application fee. Photos by Gary Cooley, 9/5/15. 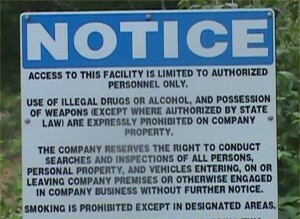 Photographing or otherwise recording this facility or its operations is prohibited without written consent from the company. Michigan’s forests are of incredible value to the people, animals, plants, and other organisms that live in and travel through the State. On September 22 Ban Michigan Fracking demanded of Hal Fitch, DEQ’s supervisor of wells, that DEQ order the company to paint over the offending language. Fitch refused. He wrote back saying there was “no evidence of any violations of either Part 615 or Part 625“, the laws he administers. The Graham Institute completed its intensive two-year report this month on high volume hydraulic fracturing (HVHF) in Michigan. One thing in the executive summary that it got right was a criticism of the DEQ’s current policy involving the public and well permitting. It said the policy “hinders transparency about HVHF operations in the state.” Fitch’s response proves the point. The next day BMF made the same demand of DNR. 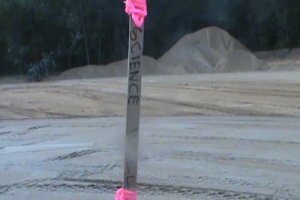 DNR promptly sent staff to the pad and told the foreman to take down the sign. The threatening bullying sign had been up, unchallenged, for three weeks. On May 5, twelve members of the Michigan House introduced a pipeline secrecy bill, HB 4540. The bill would amend Michigan’s Freedom of Information Act, or FOIA law. Before-and-after pictures of clearing for the pipeline along King Road, taken by neighbor Gary Cooley. Cooley found flattened Kirtland’s warblers in excavated dirt on the day and near the location of the third picture. Click and then click again to enlarge. Both proponents and opponents have focused on oil and gas pipelines and high-powered electrical lines as the critical energy infrastructure which the bill targets. But in ordinary discourse the term also includes oil and gas production. In the future as wind and solar begin to take hold in the state, central production and transmission facilities related to them would seem to be included too. If the bill were amended to exclude production, the primary agency affected by it would be the Michigan Public Service Commission (MPSC) which regulates transmission of oil, petroleum, electricity, and gas. What follows is an object lesson, where secrecy of gas pipelines proved disastrous for Michigan forests and wildlife. 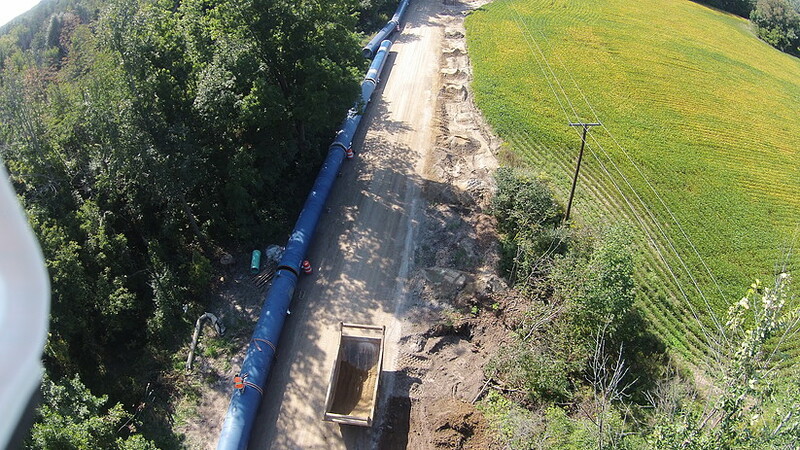 To build a gas line, a company has to give MPSC a plat showing the line’s dimensions, character, compression stations, control valves, and connections. Similar details are required for oil, petroleum, or electric lines. In January 2013 deep-shale fracker Encana Oil & Gas (USA) applied for and MPSC permitted gathering lines for two horizontal wells. 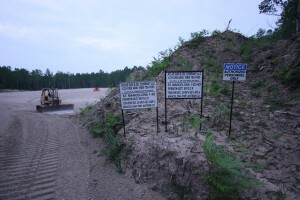 The lines were to connect the wells to a transmission line crossing southern Crawford and Kalkaska Counties. This is Kirtland’s warbler territory. Kirtlands are federally endangered birds. If you kill one you pay a fine or go to jail or both. Encana asked MPSC to process the applications “ex parte” — which means secretly. MPSC obliged. Neighbors near the lines had no chance to object. Twenty days later MPSC granted the applications in boilerplate decisions. Only then did the existence of the proposed lines became public. Neighbors John Buggs, Dan Bonamie, and Gary Cooley live in inholdings of the state forest which the Crawford County line traverses. The line goes along King Road, what was once a stately woodland two-track. They and their neighbors walk, hunt, and bird throughout the area. Encana had submitted environmental impact assessments (EIAs) to MPSC. But the EIAs were slopwork, supposedly authored by Encana’s surveyor but unsigned. His only enviro credential is a certificate to teach high school biology. 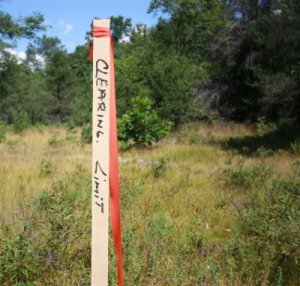 The EIAs made no mention of the nearby Kirtland nesting sites, and did not even claim to investigate environmental impacts in the forest alongside the pipeline easements. MPSC didn’t read the EIAs, saying that wasn’t its job. Buggs and Bonamie tried to intervene and ask for reconsideration, but the agency refused, holding they lacked standing. The two appealed to the court of appeals, where Encana argued again they lacked standing. Meanwhile the company spent $2 million and built the lines, flattening two Kirtland’s warblers in the process, according to witness Cooley’s affidavits. Cooley reported the find to two Encana contractor employees who refused to even look at the dead birds or report the incident to DNR as required. Cooley also took before-and-after pictures of the one line which goes by his place. 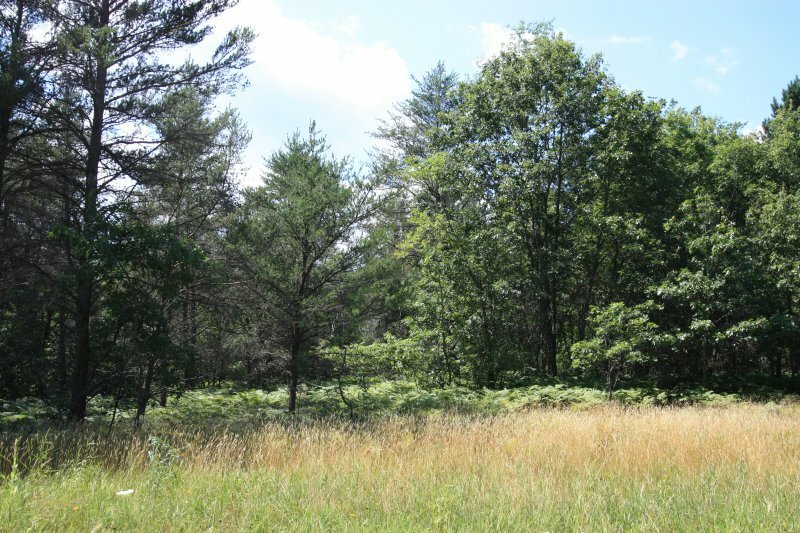 DNR had allowed easement widths of 35 feet, but the company used 53 feet including an 8-foot strip of roadside trees along King Road outside the easement boundary. The court was shocked by Encana’s standing argument. It told the company that dismissing the appeal “may result in a miscarriage of justice.” It added environmental review is the job of every agency, under longstanding Michigan precedent. It reversed the MPSC permits as “unlawful,” and remanded to the agency. Meanwhile Encana had sold the lines to DTE Michigan and the wells to Marathon Oil. DTE then told MPSC it should now read the EIAs and re-affirm the permits summarily with no hearing. Getting some backbone for a change, MPSC refused. The EIAs were “mere guesswork,” it ruled. Then it gave DTE till August to try to show the “efforts [it] made and resources [it] used” to produce the EIAs. MPSC did not ask DTE to submit new EIAs by someone who does have credentials. Any new EIA — after Encana already gouged the forest — would be untimely by 2½ years and objectionable. Recognizing the “interest” the case has generated, MPSC issued a press release and will allow public comment for 30 days after DTE’s submission in August. Pleadings and decisions in the case are at this link. The technical details provided by Encana when it applied for the lines is in items 1 and 2 of the link. The details include pipe specs and diameters, wall thickness, minimum yield, joint information, coating information, fitting information, maximum and normal pressures, max/min/expected operating temperatures, and other data. In particular the details showed the line diameters would be 6.625 inches (commonly referred to as 6-inch). This is the kind of detail which MPSC would be privileged to withhold under HB 4540. Are such details important to Buggs’s and Bonamie’s case? After the court decision, DTE did not remove the lines. It didn’t even stop operating them. Today it is making money off them. But the law provides for fines and a year of prison for corporate officers who have or operate a line without a permit. Here we have two lines and no permits. Buggs and Bonamie began to question DNR about the 35-foot easements over which the lines run. The width of the easement determines how wide a forest swath can be excavated and cleared for a line. DNR procedure, in effect since 2005, recommends widths of 20 feet or 30 feet. So why did DNR allow 35 feet for these lines? And why did it allow taking of the 8-foot strip in violation of its 1994 policy that roadside trees make a “significant contribution to the natural beauty of the surrounding area”? Note: This requested easement is for 50′ not the normal 20′. This is because of the kind of pipeline being put down…. [D]iscussions about the width … are still on going in the Department. A final determination of width will be made by the time the easement is issued in Lansing. FOIA information shows that in the case of this line, DNR did comply with the normal procedure — in writing — and allowed just 20 feet. But when Encana started excavating and clearing it went out 35 feet. DNR’s reaction: It just winked. In the case of the other line, the written permission stated 35 feet. No FOIA notes of the DNR decisions show why it deviated from “normal” 20 feet. But there are clues suggesting possible explanations. One is that the company overstated the line diameters. It told MPSC they would be 6 inches and DNR they would be 8 inches. Companies are supposed to be straight with public authorities. But neither MPSC or DNR have demanded an explanation of the contradiction. DNR fell for it and may have used the exaggerated diameters as an excuse for too-wide easements. The second clue may be that something in the technical specs — perhaps the steel construction material or the expected pressure — motivated the deviation. If this information caused DNR to violate its longstanding “normal” procedure, then the public is entitled to know. The width issue goes to the core of the DNR’s mission. Its job is to protect state forests from fragmentation, not violate rules secretly just because a powerful company wants it to. But it is exactly the kind of data which MPSC and DNR could withhold under HB 4540, by simply declaring terrorists might use it. In May, Buggs and Bonamie sued DNR in the court of claims to vacate the easements and restore the slashed forest. DNR has not yet responded. Regardless how the new suit turns out, HB 4540 will allow MPSC and DNR to continue hiding information, and eating out of the hands of the frackers. Adrian Today reported on May 10 that a search of campaign finance records shows that all the bill’s 12 sponsors received financial support from the energy industry in 2014. 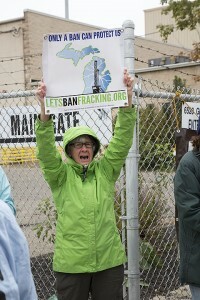 The litigations are supported by Ban Michigan Fracking. 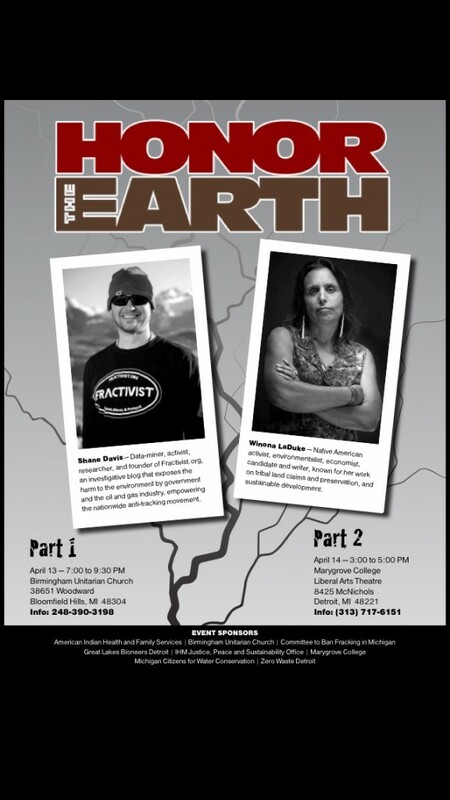 Come to two events with Committee to Ban Fracking in Michigan, and other co-sponsors, with Winona LaDuke of “Honor the Earth” and Shane Davis of fractivist.org. See posters for details.